British-Australian live cinema artist Sally Golding, winner of the 2017 Oram Award, and UK electronic musician and creative technologist Spatial work together to create an immersive space situated between cinema and club. Their performances unravel in the spirit of a ‘happening’ – an encounter between audiences, space and the elements of cinematic abstraction – which they explore via their interest in expanded cinema and sound system culture. ‘Decompression’ turns the auditorium upside down and inside out, with a generative audiovisual composition using sound, programmed LED lighting and smoke interfering with projection beams activating the space of the cinema. 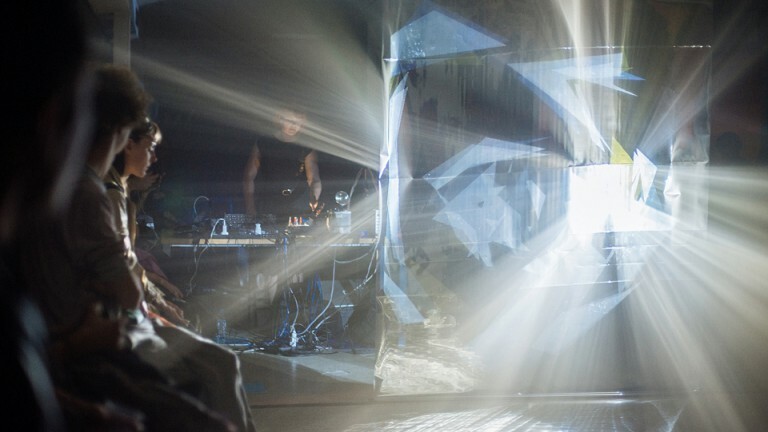 The performance explores the frequency of light and sound, creating a sensory and hypnotic live set which challenges the viewer’s expectation of auditory and visual perception. Specially made for Tyneside Cinema's 'Projection' series of artist film.